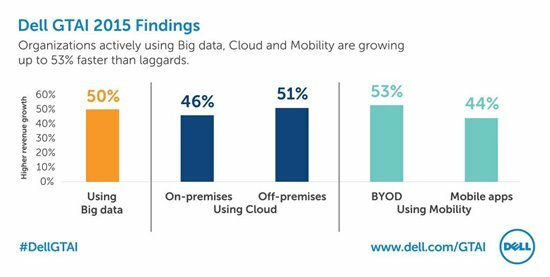 The Dell Global Technology Adoption Index 2015 surveyed IT and business decision makers of mid-market organizations around the world to uncover how they perceive, plan for and utilize four key technologies: cloud, mobility, security and big data. 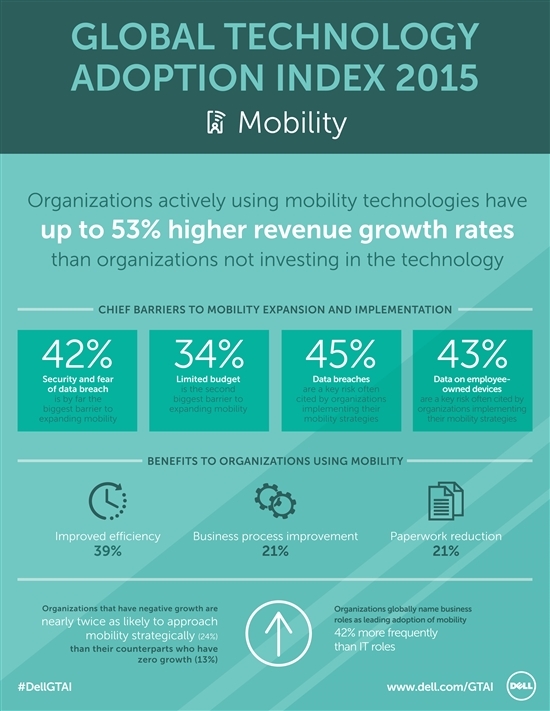 According to the GTAI 2015, organizations actively using cloud, mobility and big data technologies are experiencing up to 53% higher revenue growth rates than those that have not invested in these technologies. 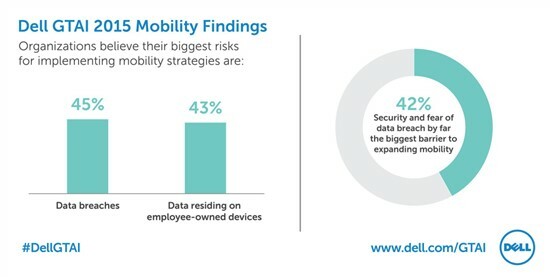 Despite this strong link between technology use and revenue growth, cost joined security as a chief barrier to the adoption and expansion of cloud, mobility, security and big data. In addition to revenue growth, the study found that organizations utilizing these technologies report key benefits related to improved efficiency and organizational growth goals. 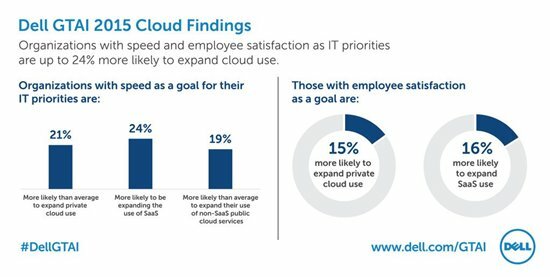 Cloud adoption is uniquely driven by expectations of greater organizational speed and employee satisfaction. 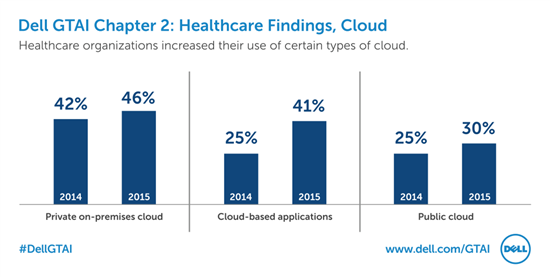 Organizations with these two factors as key IT priorities are up to 24% more likely to expand cloud use. 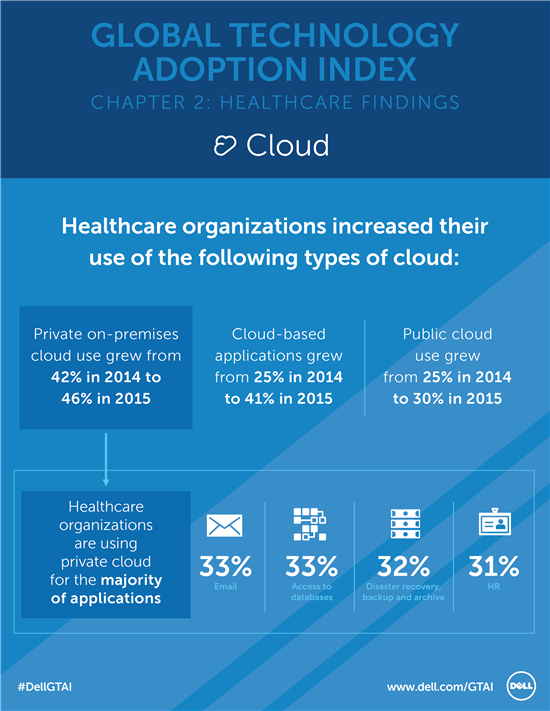 Cloud use continues to increase globally from 79% in 2014 to 82% in 2015, and Western Europe is at the forefront of this growth, experiencing the greatest increase in cloud use year over year (from 75% in 2014 to 81% in 2015). 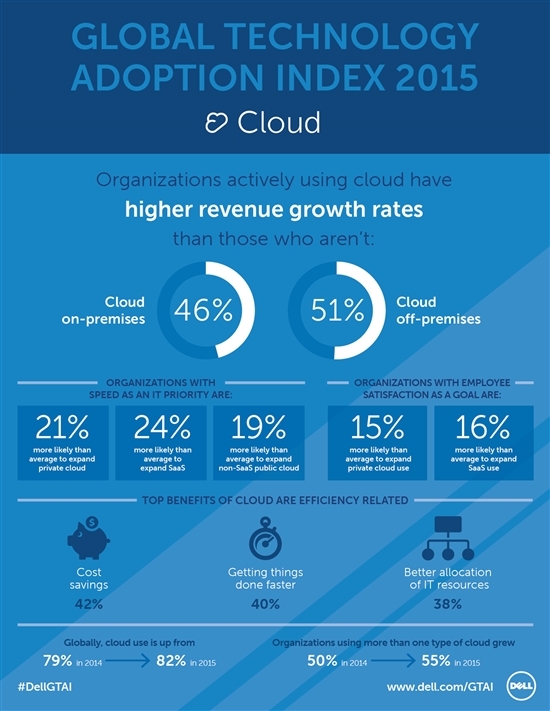 For organizations utilizing cloud technology globally, the top three benefits experienced include: cost savings (42%), getting things done faster (40%), and better allocation of IT resources (38%). 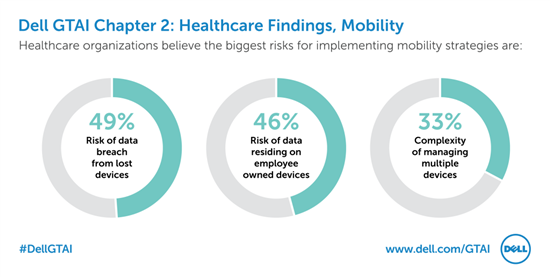 According to the GTAI, those with robust use of BYOD programs show 53% higher revenue rates, and mobile applications show 44% higher revenue rates compared to organizations not deploying these technologies. For those using mobile technologies, 39% of organizations cite improved efficiency as the greatest benefit, followed by business process improvement (21%) and reduction in paperwork (21%). 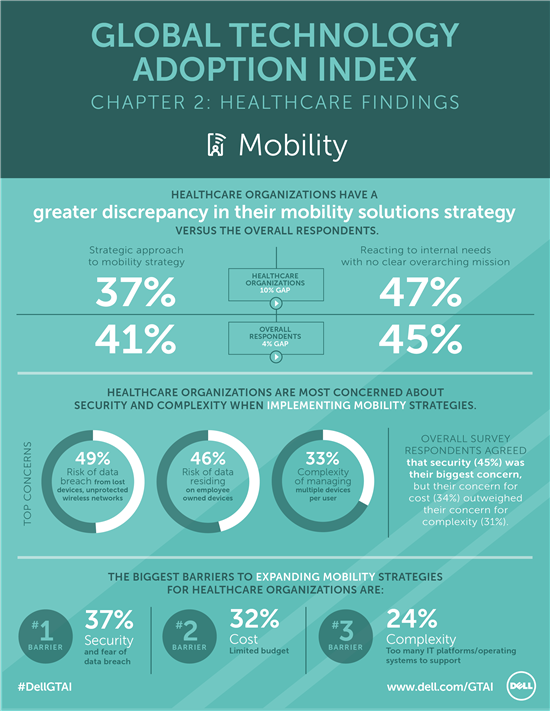 On the other hand, organizations cite security concerns (42%) and cost (34%) as the two biggest barriers to expanding mobility. 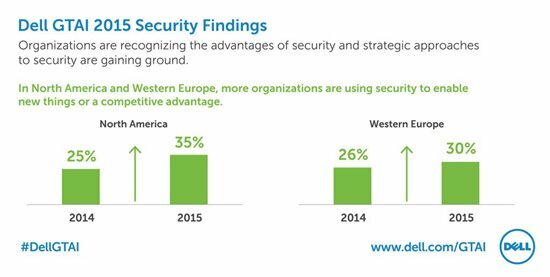 Organizations are recognizing the advantages of security and are becoming more strategic in their investments, with strategic approaches to security gaining ground in North America and Western Europe. 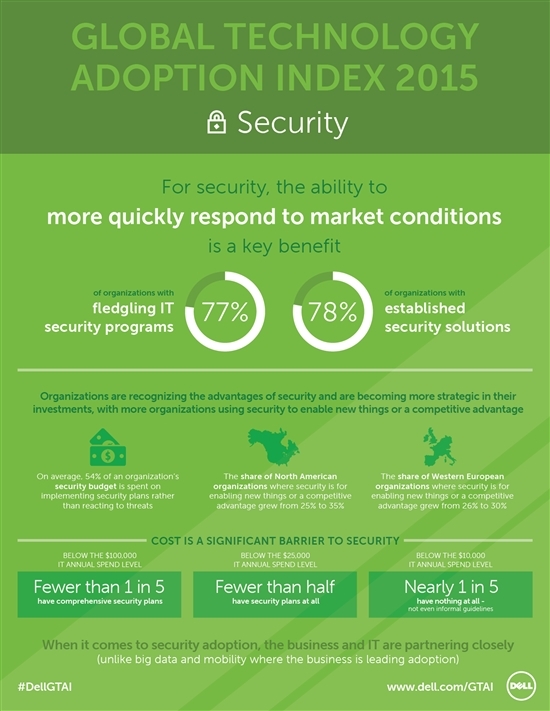 The share of North American organizations using security to enable new things or a competitive advantage grew from 25% in 2014 to 35% in 2015. And in Western Europe, the share grew from 26% in 2014 to 30% in 2015. 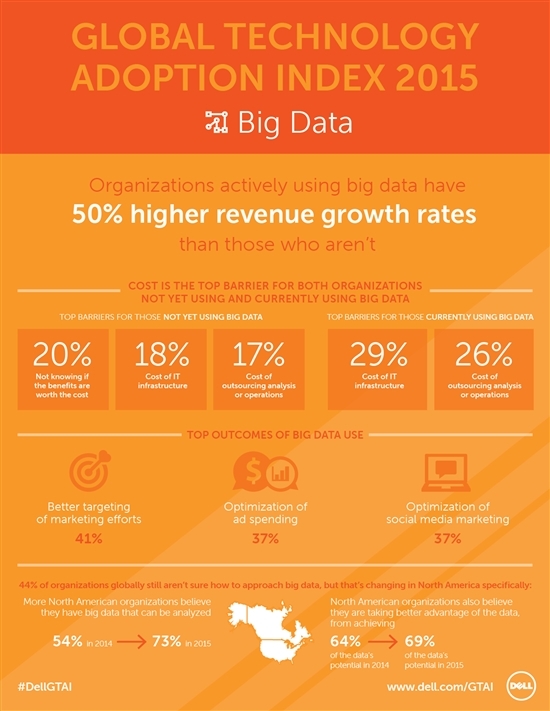 The GTAI found that organizations actively using big data show 50% higher revenue growth rates than those who aren’t, with the top outcomes for big data use tied to initiatives that drive competitive advantage by retaining and growing customers. 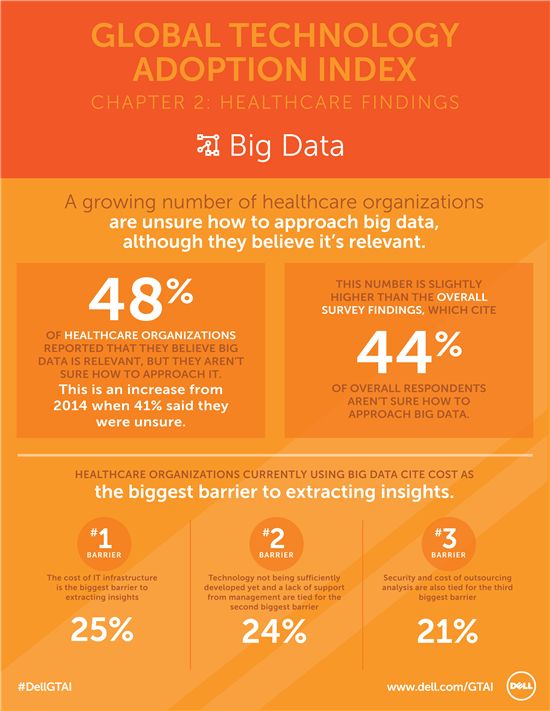 Despite the benefits, results show that 44% of organizations globally still struggle with how to approach big data. Cost is a significant barrier to big data – for both organizations not yet using and currently using big data. 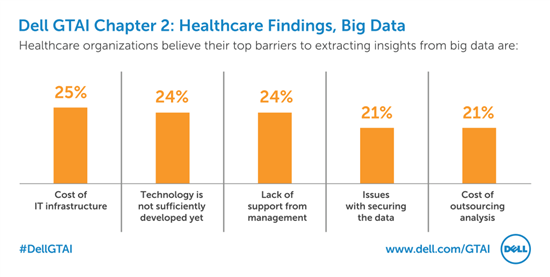 In fact, for organizations not yet using big data, the number one barrier is not knowing if the benefits are worth the cost (20%). 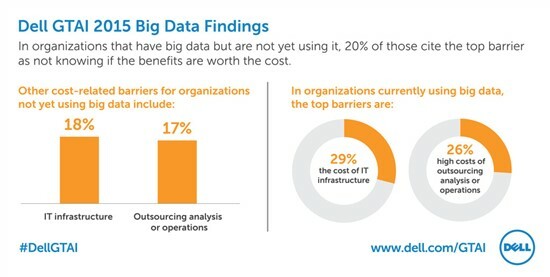 For organizations currently using big data, 29% cite the cost of the IT infrastructure as the biggest barrier.